Killarney lies near the coast in the southwest corner of Ireland in County Kerry. 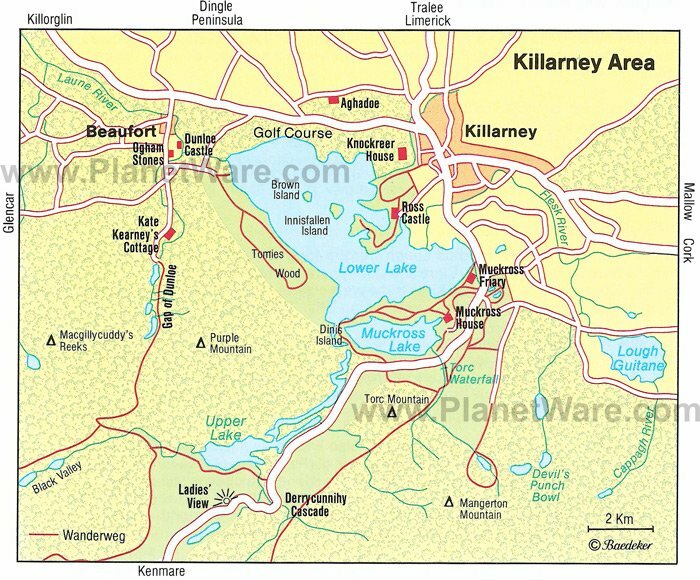 Nearby are the much-visited and picturesque Killarney Lakes. The beauty of the surrounding area and the wide range of recreational activities make Killarney one of Ireland's most popular tourist centers. The town has been somewhat over-developed with hotels and bed and breakfasts, however this means there's plenty of places to stay to suit all budgets. It's fair to say that many of Killarney's must-see attractions lie outside the town, and if exploring the westerly fringe of Ireland they should be high up on any visitor's itinerary. This eye-catching 19th-century Victorian mansion, an easy 16-minute drive from Killarney town center, is in a magnificent lakeside setting in Killarney National Park surrounded by sumptuous gardens and parkland. The house is near the shores of Muckross Lake, one of Killarney's three lakes. Four successive generations of the Herbert family occupied this location, although the house visitors now see was completed in 1843. Queen Victoria famously stayed here in 1861, and huge improvements to the structure and gardens were made prior to her visit. Touring the beautiful house is a must-do as is a jaunt around the lavish gardens in a jaunting car (pony & trap). A visit to the traditional farms is worthwhile. Here is a very different Ireland based on rural life during the 1930s and 40s, a time when there was no running water in many countryside dwellings and electricity wasn't yet available nationwide. There are three working farms, each with animals and machinery of the day. Visitors can also explore a Carpenter's Workshop, Labourer's Cottage, and Blacksmith's Forge. The rural schoolhouse is a real treat and particularly fascinating if visiting with children. A free coach service circles the site continuously. From Muckross Boathouse (close to Muckross House) visitors can take a boat to the cottage, which was built by the Herbert family and looks out over the Middle Lake. The cottage has been variously described as a hunting lodge and woodcutter's hut and dates back to the 1700s. It has been restored in recent years and now operates as a Tea Room. The Meeting of the Waters and the Old Weir Bridge lie a short stroll away. The cottage windows feature the names of many well-heeled visitors who carved their names with their expensive diamond rings; the earliest dates back to the mid 1800s. A drive of just under two kilometers back along the N71 in the direction of Killarney brings visitors to Muckross Park Hotel with access to the ruined friary (a short walk from the public car park). Founded in the 15th century, it remains remarkably preserved. A notable feature is the tower, which was added after the initial construction. It is the only Franciscan tower in in the country which matches the width of the church itself. Surrounding an old yew tree, the cloister and related buildings are complete. The monks had to abandon the friary in 1652 during the Cromwellian campaigns. Around 13 minutes' drive on the N71 from Muckross House is imposing 15th-century Ross Castle. Built by the O'Donoghue clan, the Castle came under the possession of the Browne family who became Earls of Kenmare and owned a large part of the lands comprising Killarney National Park. The structure consists of a tower house surrounded by walls with more round towers. An old prophecy predicted that the castle would only ever be taken by an attack from the water. In 1652, taking advantage of this, Cromwell's General Ludlow had a large boat launched in the Lower Lake whereupon the defenders, seeing this as a fulfilment of the prophecy, at once surrendered. From the pier at Ross Castle, visitors can be rowed out to the quiet little island, the site of a 7th-century monastery. It's rumoured that Brian Boru studied here. At the beginning of the 13th-century, the Annals of Innisfallen (a major source of early Irish history) were written here and are now in the Bodleian Library in Oxford, England. On the northeast side is a small 12th-century church of red sandstone. Innisfallen still preserves the old native woodland of Ireland, namely rowan, ash, yew, and holly. Killarney National Park & Lakes is a little under 16 kilometers from Ross Castle, although the castle and its environs all form part of this national heritage site. There are smaller winding roads and cycle tracks to be explored if preferred. Walking and cycling provide the best ways to see the park. All routes afford spectacular views of Killarney's beautiful scenery. At its heart is the Bourne Vincent Memorial Park so named after the Bourne family and Senator Vincent from California who presented the park to the Irish State in 1932. Maps and information are available at the park information centers. A drive of 11-kilometers or so takes visitors up through the scenic Gap of Dunloe, a narrow mountain pass carved by glacial ice. This rocky pass separates Purple Mount and its northern foothills in the western part of Killarney National Park from Macgillicuddy's Reeks. It's best reached from the R562, which follows the north side of the Lower Lake. From the road to the Gap, visitors can see Dunloe Castle, tucked in a grove of trees, as well as a group of Ogham Stones (National Monument). From Kate Kearney's Cottage, the four-kilometer climb to the pass is usually completed in a jaunting car, on foot, or on a pony. From the top there are superb views of hills, valleys, and lakes. When arriving in Killarney visitors can't help but notice the proliferation of horses and traps, otherwise known as Jaunting Cars. This is the traditional way to tour all of the local attractions, out in the fresh air and in the company of a Jarvey (driver & guide) who will tell stories and keep visitors entertained every trot of the way. Jaunting Cars are available for both groups and those traveling alone. Tours include Ross Castle, Muckross House & Gardens, and other top sites in and around Killarney. Jaunting cars can be booked through hotels and at major tourist attractions, or simply by approaching a driver/guide and taking it from there. The Killarney Park Hotel: five-star luxury, fantastic location, old-world elegance, marble bathrooms, wellness spa, lovely pool and hot tub, turndown service. Killeen House Hotel: three-star hotel, Edwardian-style house, gracious hosts, quaint decor, beautiful gardens, golf memorabilia. The Ross: mid-range boutique hotel, center of town, family-owned, stylish decor, comfortable rooms, free use of leisure facilities at sister hotel. Old Weir Lodge: budget-friendly bed-and-breakfast, helpful staff, comfortable beds, excellent breakfast.